« Can Anybody Read This and Not Despise the IRS? Okay, the title’s an exaggeration, but this chart is rather revealing. 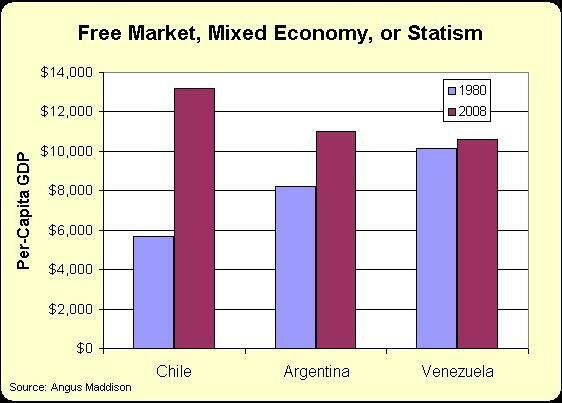 It shows how per-capita GDP has changed between 1980 and 2008 in Chile, Argentina, and Venezuela. As you can see, Chile used to be the poorest of the three countries and now it is comparatively rich. Argentina has enjoyed a bit of growth. Venezuela, by contrast, used to be the richest of the three nations but has stagnated and now is in last place. So what accounts for these remarkable changes in relative prosperity? The answer, at least in part, is the difference between free markets and statism. Simply stated, Chile has reduced the burden of government a lot in the past three decades, Argentina has reduced the burden of government a little, and Venezuela has gone in the wrong direction and increased the burden of government. The following numbers come from the Economic Freedom of the World, which looks at all facets of economic policy, including regulation, trade policy, monetary policy, fiscal policy, rule of law, and property rights. * Chile’s score jumped from 5.6 in 1980 to 8.0 in 2008, and the country now ranks as the world’s 4th-freest economy (ahead of the United States!). * Argentina’s ranking has improved a bit, rising from 4.4 to 6.0 between 1980 and 2008, but that still only puts them in 94th-place in the world rankings. * Venezuela, by contrast, is embarrassingly bad. The nation’s score has dropped from 6.3 to 4.4, and its ranking has plunged from 22nd-place in 1980 to 121st-place in 2006. Since Adam Smith probably never imagined a world filled with things such as OSHA, the Department of Energy, the IRS, agriculture subsidies, and fiat money, his recipe might be a bit dated, but the general idea still holds. How hard is it to figure out, when you give people freedom to live they value their lives and their outputs more? Chart says it all, Dan! Wow, great graphic, Dan. Thanks for sharing this.